Star Dust is a science fiction-themed online casino pokie game powered by Microgaming. This online pokie game was released in December 2015. The developer refers to the game as a game with a ‘‘retro arcade feel”, the sound effect and graphics also witness that. You can play this online casino pokie game for real money at one of our selected Australian online casinos. 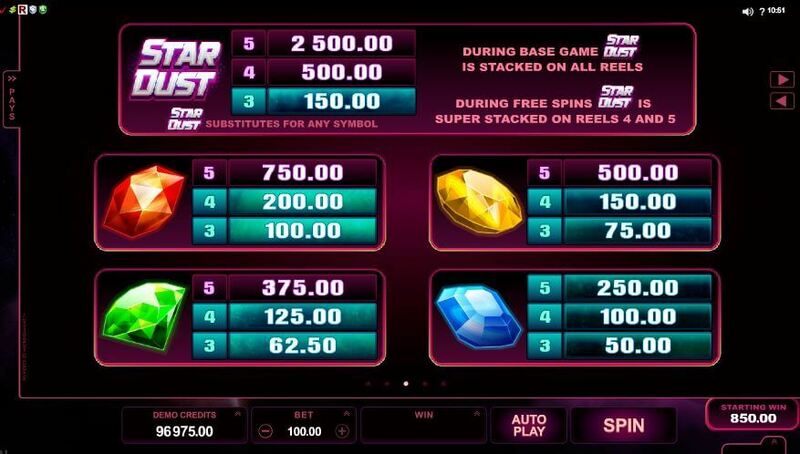 Star Dust consists of a five-reel slot, four rows and forty paylines. The design for this pokie game is very basic, the colour of the backdrop to the reels’ features is purplish view of distant stars and planet. The game is accompanied by a great musical sound effect. Symbols are slightly unartistic and have four gems-blue, yellow green and orange along with A, J, K Q and 10. When you take a look at this online pokie, you will see that there is a meter on the right of the five reels when a Galaxy symbol reaches on reel number three, this will bring together gems from the other reels, maximum one per reel. The gems are added to the meter and once it’s full, the player will get a payout plus ten Free Spins. In the base game, when Galaxy symbol appears on the third reel, the player will get one gem. The number of gems are displayed on the meter screen for players. The gem collection feature is the most exciting part of this game. However, when you look at it, is a very basic looking online pokie game. Star Dust’s graphics are great, but predictable when compared to other Science Fiction themed pokies. It’s god for a couple spins, but there isn’t much else to this online pokie. For these reasons, we award Star Dust a stellar three stars out of five.